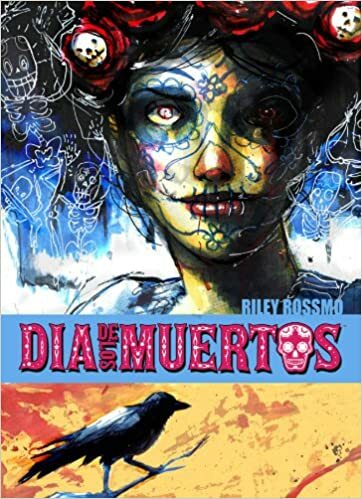 Riley Rossmo Shines as Others Fall: Dia De Los Muertos – LILY & GENEROSO 4EVER! Of late, I have gobbled up quite a few comicbook anthologies featuring short stories from a range of creators, all united by a single motif. While I never mind diving into a lengthy graphic novel, something about the anthology form, when right, has a spark of light and energy to it that makes reading it enjoyable. That perceived vivacity, in part, comes from my hope to be surprised by the work of creators I already know, but most of my excitement for anthologies stems from the chance to discover new talent. Furthermore, with an anthology contribution, brevity and efficiency emerge as the highest priorities for each story, providing a challenge that tests each creator’s skills and limits and teaches us as the audience how to tackle storytelling constraints. Whereas other collections (such as the superb Humanoids anthology, The Tipping Point), have multiple artists and writers, Dia De Los Muertos has Riley Rossmo as the primary artist paired with the writing talents of Alex Link, Christopher E. Long, Dirk Manning, Joshua Williams, Ed Brisson, Jeff Mariotte, Alex Grecian, Kurtis J. Wiebe, and Joe Keatinge. As a result, Rossmo has the greatest challenge of matching the visuals to the scripts of a range of writers with different specialties and vastly different approaches in interpreting the Day of the Dead, and he rises to the occasion. I wish I could give similar praise to the various scriptwriters. With the exception of Alex Grecian’s “Return of the Dead,” Joe Keatinge’s “Day of the Dead 3000,” and Joshua Williamson’s “Mine,” the stories fail to explore the richness and complexity of human emotion and reaction to the traditions and legends Dia De Los Muertos, making many of them feel too facile and unoriginal. In the shadow of Rossmo’s deft ability to transform his style throughout the anthology, most of the stories look even weaker, for the art and the layout have to carry more of the storytelling weight, but alas, even outstanding art cannot save a weak script. The weakest stories fall into two categories: ghost tales about love or about spirits seeking vengeance. Dirk Manning’s “Te Vas Angel Mio” and Kurtis J. Wiebe’s “Lonesome” look at the love of a lost one with the sentimentality of a Lifetime film or that abhorrent Sandra Bullock vehicle, The Lake House (I’m ashamed that I watched even two minutes of this travesty…). Far different in topic but no less unimaginative, Christopher E. Long’s “Reflections” and Ed Brisson’s “The Skinny One” present ghosts of revenge for wrongdoing that evoke more self-righteousness than any terror. Though Alex Grecian’s “Return of the Dead” does end with a certain level of revenge on an evil one, the story and the art combined create an eerie and horrific tale that will make you shiver, and the extent of the awfulness of the villain provokes fear (and a few shudders), pulling it far above “Reflections” and “The Skinny One,” despite their shared topic. As much as I enjoyed Grecian’s take on Dia De Los Muertos, I will admit that it did not feature anything beyond prediction. In contrast, Joe Keatinge’s “Day of the Dead 3000” and Joshua Williamson’s “Mine” do have unique and surprising elements to them, thus making them the most distinctive of the collection. Keatinge places the supernatural elements of Day of the Dead in the future and in the hands of a pessimistic and disillusioned fashion photographer, creating a cleverly nihilistic anti-superhero tale that explores the psychology of the adults of the future (and now) who inherit the problems of the past but feel indifferent to them. Paired with Keatinge’s excellent script, Rossmo creates the perfect art to match the fun but slightly cynical tale that incorporates more than just the skulls and ritual of the Day of the Dead. Joshua Williamson has a far more traditional perspective on the motif, weaving the festival activities in Mexico in the mystery to find a girl, but right before the end, he takes a screeching turn in an unexpected and chilling direction. Illustrated with a innocence and brightness of a comic for children, the antithesis between what Williamson and Rossmo want you to believe will happen and what actually does distinguishes “Mine,” making a story that at first looks cheery all the more disturbing. Placed halfway into the collection, the section of a work that our human minds tend to forget the most, “Mine” will be severed into your memory due to its style and final detour. As a whole, Dia De Los Muertos has some gems in storytelling, but it mostly serves as a showcase of Riley Rossmo’s diverse talents as a comicbook artist. Though most of the stories are forgettable, the collection is still worth a look for the stronger ones and for Rossmo’s chameleon artistic abilities. And, as with any short film compilation, if one work does not satisfy you, another one will arrive very shortly, a nice feature of the anthology and perhaps one of the reasons why they have caught my attention recently. Dia De Los Muertos is available via Image Shadowline.